According to the American Pet Products Association (APPA), 42.9 million households own a cat. The average lifespan of a cat is 15 years, so no matter where you’re at in life when you first meet your beloved feline, you’ll certainly grow together. In recent news, for example, an Japanese grandmother calledÂ MisaoÂ bid farewell to her rescue, Fukumaru. Even as an elderly woman, she learned a lot about the simple joys of life through her cat. Thanks to Misao’s photographer granddaughter Miyoko Ihara, their memories have been well documented and immortalized in books and sites across the Internet. As independent as these creatures are, they’re always there for us. They’ll be there through your moments of happiness and heartbreak, so it’s important that we’re there for them as well. 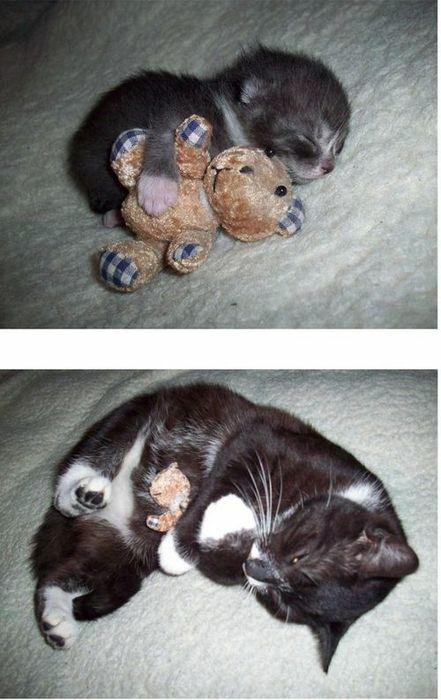 Below you’ll find 25 photos of before and after photos of cats that’ll make you melt. #1. Look at how much these two have grown! #2. All tucked in for bed. #3. They always like to do things on their own terms. #4. These two sisters look nothing alike, but are equal parts adorable. Check out that beautiful white paw! #5. This unique bed was upstaged by this acrobatic cat. #6. Just a cat in a hammock. #7. This pretty eyed cat wants to be a photographer (or maybe just photographed). #8. A fancy cushion suited for this gorgeous pet. #9. When your sink overflows with all kinds of orange adorable…. #10. They’re so innocent when they’re young and then they give you all this sass (which is part of why you love them so much). #12. This one grew big enough to rest their paw on the edge. #13. We know. Our hearts are melting, too. #14. They like to get creative, too. #15. They can be super affectionate (but they have to be the ones to ask for it). #17. They stay with you through your phases (even if you never outgrow them). #18. Snow White has grown up to be one fine kitty. #19. Super cat is lookin’ pretty super. #21. Remember when you had enough room to sit? #22. A rescued kitten receives love and care into adulthood. #23. “Three’s a crowd” doesn’t apply to those who don’t have a sense of personal space. #24. Show me a cat that’s more majestic than Walter. #26. This adopted cat started out with respiratory issues, but look at how fluffy he’s gotten! So fluffy!